List different ways to modify reports. Adjust reports for different users. Modify a report with permanent filters. Modify a report on the fly. Sales managers aren’t the only users who want to know how things are cooking at Ursa Major. Company execs need data, too. But they’re focused on more than just a few reps and deals. They want to know what’s happening across the company. Ursa Major has a large and active sales department with many managers. Maria knows it’s going to save time when execs at Ursa Major can look at data collected across all the sales reps. Now that she has a few reports set up for sales managers, she’s going to make a bunch more reports the easy way. What’s the easiest way to do anything? Take something you’ve already got and change it up a little. You’ve probably already noticed how we turned one report into three in the previous unit. 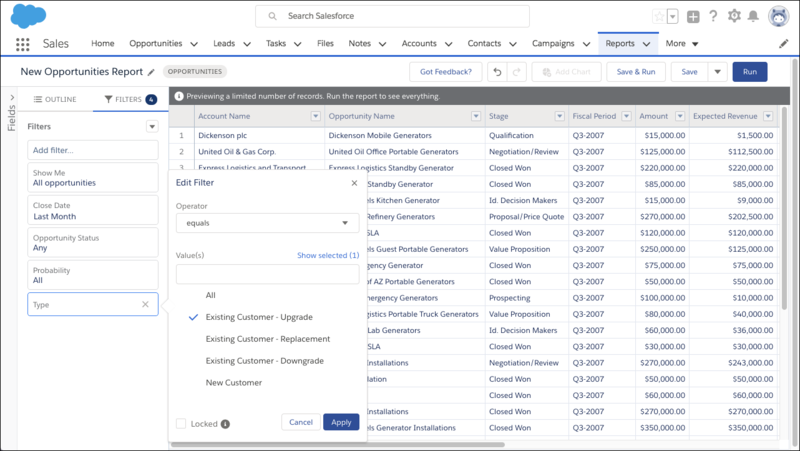 Reusing your work is efficient, and Salesforce lets you change up your reports in a bunch of different ways. Let’s run through a few of the changes you’ve already tried out. Filters determine how much data is included in the report. You can limit the data included in the report using a tight filter, such as by setting the date range for your report to Last Week. Or you can broaden the data, such as by choosing to show opportunities in Any status. Click the Add button to create a logical test, such as to include only records with an amount greater than $10,000. It’s easier to see some information if it’s collected and displayed as a group. For example, you want to sort the group by Opportunity Owner to review owner progress, or by Type to check how your scheduled business is balanced. Summarizing performs calculations on your numerical data. For example, you want to find the total value of your open opportunities using Sum. Or you want to determine the average size of your deals using Average. You can process your data with formulas. For example, you determine the average age of a given rep’s opportunities by grouping by rep. Then you create a formula to show the average age of the rep’s deals. You—or individual users—can modify reports while viewing them in a couple ways. Click a column header to change the sort order of your data based on what’s in the column. Refine a report’s data by opening the filter panel. This temporary filter changes your view, but doesn’t change the data included in your report. The data each user can see depends on their profile, permissions, sharing settings, and position in the user hierarchy. As the admin, when you run your Opportunity Pipeline report, you see all the data in your org. But when a sales rep runs the same report, the only opportunities that appear on the report are the ones that the rep has permission to view. Maria’s going to make some quick and easily tweaks to her existing reports to broaden them to serve the big-picture needs of her execs. This is an easy one, because Maria already made a version of a Closed Business report. And so did you if you completed the challenge in the previous unit. But that report summarized all business over the past year. One of Maria’s execs requested a report that helps track how well the company’s doing at upselling customers on upgrades. He wants to see only upgrades that closed in the past month. Locate and run the Closed Business YTD report. Select the Closed Business YTD report. From FILTERS, update the range of the date filter to Last Month. Click Apply. Filter for just one type of customer. From the Add filter... lookup, select Type. Leave equals as the Operator. From Value(s), select Existing Customer - Upgrade. Click Save As and save the report as a new report called Upgrades (Last Month). If you haven’t closed any opportunities lately, your new Upgrades (Last Month) report won’t display any data when you run it. Maybe you’re wondering when the last time your company completed any upgrades was! Locate and run the Upgrades (Last Month) report. In the filter panel, click the Close Date filter. Change Range to Previous 2 FY. Use these resources to learn more about reports and dashboards.